Bring a pool/excursion towel — Your room towels are not allowed to be used at the pool or on the excursions. If you bring a room towel to the shuttle, unfortunately you will to be allowed to board the shuttle. Sunscreen — It's bright out there! If you missed signing up for a shuttle, unfortunately we are sold out. If you reserved a shuttle, you were sent instructions via email earlier this week. Uber and Lyft are now available for pick up at the Asheville airport. If you are stuck at the Charlotte airport, your best bet is a rental car. From Interstate 40, take Exit 66 (Ridgecrest). Turn left (if traveling east) or right (if traveling west) onto Dunsmore Avenue. Proceed for 0.2 miles. Turn right onto Old U.S. 70, proceed for 1 mile. The Ridgecrest entrance will be on the left. Upon arriving at Ridgecrest you will enter through the guard gate and proceed to the large building on the left named Pritchell. Head up the front stairs and you will see signs directing you to conference registration. Our conference “Hub” is located here and is the place you will check-in and get all of your questions answered. Registration at the Hub will take place from noon until midnight on Sunday August 5th. Your bedroom will be available by 4:00pm Sunday, August 5th. If you arrive before 4pm on Sunday, you can store your luggage at the Hub while you enjoy the beautiful property until your room is available. Our first meal at Ridgecrest is dinner on Sunday, August 5th. Dinner is served from 5:30-7:00pm. They run a tight ship in the Ridgecrest dining hall. If you expect to arrive after 7:00pm, we recommend that you find food before arriving at Ridgecrest. Important: You must check in at the Hub prior to going to dinner as you will need your name tag/meal pass to enter the dining hall. Please note that Ridgecrest has lots of options at meals and will have gluten-free and vegan options available at all meals. The program starts Sunday night at 8:00pm in the Spilman Auditorium. You can see the complete schedule on the website. A copy of the schedule will also be included in your welcome packet and printed on the back of your name tag. There are still a few openings left on some of the excursions and onsite activities at Ridgecrest. Check out the website for details and availability. Due to liability concerns, Ridgecrest does not allow guests to bring in food that is not catered by or purchased from Ridgecrest. Alcoholic beverages and tobacco related products are not allowed. Noise curfew from 11:30 pm to 6:30 am. Check out is Saturday 8/11/18 by 10:00am. You may check in to your room after 4:00pm noon Sunday, August 5th. If you arrive early on Sunday, our Hub will be open and you can store your luggage while you enjoy the beautiful property until your room is available. Your room towels are not allowed to be used at the pool or on the excursions. There are no guest laundry facilities onsite — There's a laundromat about a 5 minutes drive from the conference center. Please do not ship anything to Ridgecrest. There is a significant handling fee for each box sent. You can go back and review the important conference emails in the Updates sectionof the conference website. The office will be staffed by a skeleton crew of 4 brave souls during Worldwide Conference. They will maintain basic operations while the majority of the Global Support Team participates at the Worldwide Conference. Please note that the Finance Team will process donations during conference. However they will not be processing Ministry Expenses or making updates in Donor Elf (donation reports) during the week. Many of our key support staff are at conference, you are encouraged to get to know them and if you have questions about operations or our systems, please feel free to stop by the Conference Hub to connect and get your question answered. Some of our Global Support Team staff as well as the Conference Leadership Team have already started their travels! So please know that many of them may not be responding to email. 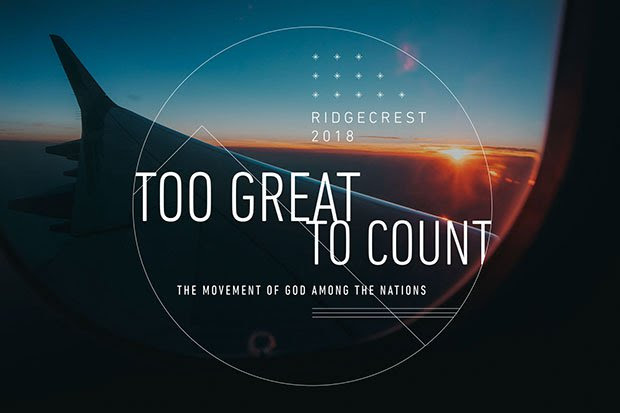 If you have a conference question, the best place to get that answered is by reading the conference website, posting a question on Workplace (CRM/Conext staff only), or by emailing ridgecrest2018@crmleaders.org. Safe travels and we'll see you soon!